One of the great aspects of the theatrical process is diving into a script and exploring all aspects of character and their text. But you can only go so far with limited time. When a character is so rich in exploration, how could you not want to dig deeper. 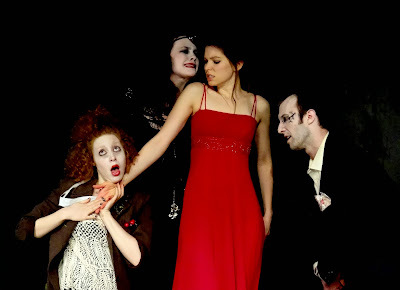 In Everyday Inferno Theatre Company’s Something Wicked, director and adapter Anais Koivisto took fan favorite Lady Macbeth from Shakespeare’s Macbeth and explored the inner workings of such a deep woman after she meets her demise in the source material. Drawing from the text itself and a mix of theatricality, Something Wicked is a great idea on the page that did not pan out well on the stage. Once you discover you’re watching Lady Macbeth stuck in a purgatory middle world pondering her next destination along with the three witches, you can’t help but wonder will this be like Stoppard’s Rosencrantz and Guildenstern are Dead. It’s soon after you discover it’s much heavier and harder to follow. This script is filled with some of Shakespeare’s infamous lines repeated over and over again. I suppose you can discover Lady Macbeth with only so much of the text. As her journey continues, the witches bring in an ensemble that take on various roles from the story, including multiple Macbeth and wife, to show Lady Macbeth her downfall. In Lady Macbeth’s middle world, we are granted musical moments and dances. And then the classic text is completely dissolved and we enter a brand new world that include scholars talking about our favorite lady. Once the four scholars hit the stage dissecting the character of Lady M, the play as we know it disappears. It was so jarring and different from what we had previously seen that it forced the audience, who was already attempting to see the dissection come to life for themselves, to feel as if they needed a lesson on what they should have been discovering. The scene, however, did allow for some nice acting moments, including a very well executed Sean Connery-like voice. In an ensemble of mediocrity, there were performances that stuck out. And luckily, for one, sticking out meant a solid performance. Jay William Thomas stuck out as the best performer on the stage. Head over heels above the rest. He discovered his moments and characters naturally and was able to tackle the text. Others seemed to be stuck in a theater school class working on Shakespeare for the very first time. Additionally Kathryn Connors, was captivating to watch as the lady of the night in her red dress. She was fluid and seductie. Director Anais Koivisto’s concept just didn’t seem to land. However her staging was something beautiful to watch. The artistry in choreography and spacing was the highlight of the production. Bonus points should be awarded for utilizing the center rotating doors to optimal use. Discovering the main architecture of the space allowed for some stunning stage pictures. Something Wicked is not a play you can go in and see blind. You need to know the source material or you will be lost. If you don’t know the text, you’d have no clue that all the actors were taking on the same roles throughout. Something Wicked is an ambitious undertaking that got lost in translation.